The most significant innovations and inventions of our time are increasingly likely to be manifest at Quantum levels. Multiple paradigm-changing Quantum Technologies provide significant solutions to current global challenges in many critical areas of human endeavour and may also present outstanding opportunities for proactive, brave and technologically savvy inventors, innovators and investors. The dawn of the Quantum Age -- full of promising new Quantum Technologies -- demonstrates that not only is Quantum Physics relevant but every literate person can appreciate its profound beauty at many subtle levels. It is estimated that about 30 percent of the US Gross Domestic Product (GDP) already stems from inventions based on quantum physics: from lasers through to microprocessors and mobile phones. The discovery that quantum physics allows fundamentally new modes of information processing is outmoding the classical theories of computation, information, cryptography and telephony which are now being superseded by their Quantum equivalents. Quantum Technologies are essentially about the coherent control of individual photons and atoms and explore both the theory and the practical possibilities of inventing and constructing Quantum Mechanisms and Quantum Devices spanning the 3Cs: Computing, Cryptography and Communications. Quantum Entanglement occurs when two entities or systems appear to us to be separate but through Quantum Coherence act as one system, with states being able to be transferred wholesale from one entity to the other but without a known signal being transferred. 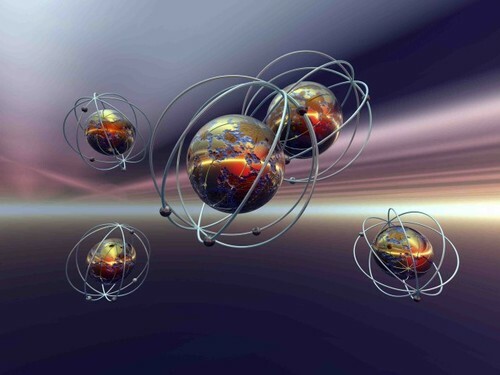 Quantum Entanglement is at the heart of our understanding how significant events across the universe operate at the macro- and micro- level in synchronicity despite considerable distance between them. Quantum Entanglement suggests that information is exchanged faster between Quantum Entangled particles than the speed of light. In Quantum Mechanics, non-locality refers to "action at a distance" arising from measurement correlations on Quantum Entangled states. The dividing line between the micro world of Quantum Processes and the macro world of classical physics is now fading faster than ever before. Evidence is quickly mounting of the use in nature of Quantum properties and processes including Quantum Entanglement. Recent science has shown that Quantum Coherence and Entanglement provide the only viable explanation for a host of mysteries in nature: how photosynthesis in plants works, how birds migrate, how millions of cells co-ordinate hundreds of thousands of activities simultaneously without significant errors, and more. It did take a long time to prove that Quantum Entanglement truly existed. It wasn’t until the 1980s that it was clearly demonstrated. In 1982, at the University of Paris, a research team led by physicist Alain Aspect performed what may turn out to be one of the most important experiments of the 20th century. Aspect and his team discovered that under certain circumstances subatomic particles such as electrons are able to instantaneously communicate with each other regardless of the distance separating them. The challenge posed to scientists with this discovery is that it violates Einstein’s long-held tenet that no communication can travel faster than the speed of light. Is the universe violating Einstein's special theory of relativity all the time? Yes, it appears that nobody has told the universe that Einstein said that nothing can travel faster than the speed of light, so it is doing its "spooky action at a distance!" Since travelling faster than the speed of light is tantamount to breaking the time barrier, this daunting prospect has caused some physicists to try and come up with elaborate ways to explain away Alain Aspect’s findings. It has also inspired others to offer even more radical explanations including that of the holographic universe! The implications of a holographic universe are truly mind boggling… Aspect’s findings imply that objective reality does not exist, that despite its apparent solidity the universe is at heart a phantasm, a gigantic and splendidly detailed hologram. To understand why a number of physicists including David Bohm made this startling assertion, one must first understand a little about holograms. The three-dimensionality of such images is not the only remarkable characteristic of holograms. If a hologram of a rose is cut in half and then illuminated by a laser, each half is still found to contain the entire image of the rose. Indeed, even if the halves are divided again, each snippet of film is always found to contain a smaller but intact version of the original image. Unlike normal photographs, every part of a hologram contains all the information possessed by the whole! This is exactly like fractals in nature and mathematics. The "whole in every part" nature of a hologram provides us with an entirely new way of understanding organisation and order. For most of its history, Western science has laboured under the bias that the best way to understand a physical phenomenon, whether a frog or an atom or a national economy, is to dissect it and to study its respective components. A hologram teaches us that some things in the universe may be understood only as integrated holistic systems. If we try to take apart something constructed holographically, we will not get the pieces of which it is made. We will only get smaller wholes or less evolved, less detailed, incomplete miniatures of the whole picture. This insight suggested to some scientists, including David Bohm, another way of understanding Aspect’s discovery. Bohm believed the reason subatomic particles are able to remain in contact with one another regardless of the distance separating them is not because they are sending some sort of mysterious signal back and forth, but because their separateness is, in fact, an illusion. Bohm suggested that at some deeper level of reality such particles are not individual entities, but are actually system components of the same fundamental something! Recent research into the structure of water by Nobel Prize-winner Luc Montagnier, and as previously suggested by Jacques Benveniste, has shown water’s ability to retain information imprinted into it in a stable manner that is retrievable at a later date! The same principles of Quantum Entanglement, Resonance and Coherence apply to other fields, such as telecommunications, computers, and energy. Imagine communication devices that need no cables or even a wireless infrastructure. Imagine information being able to be transported magically over distances in a holistic state-dependent way instead of bit by bit or in packets. There are some real and amazing applications of Quantum Entanglement in the security world. It can be used to produce unbreakable encryption. If we send each half of a set of entangled pairs to either end of a communications link, then the randomly generated but linked properties can be used as a key to encrypt information. If anyone intercepts the information it will break the entanglement, and the communication can be stopped before the eavesdropper picks up any data. The Roman philosopher Cicero observed more than two thousand years ago, "Everything is alive; everything is interconnected!" or "Omnia vivunt, omnia inter se conexa!" We are beginning to see the entire universe as a holographically interlinked network of energy and information, organically whole, undergoing rapid evolution. The "point" of the Singularity is reached essentially when all of the scientific and technological innovation trends appear to go out of control at the human level, ie, they have moved beyond our event horizon, and we can no longer follow along any previous linear logic or understanding to comprehend their combined effects. That technological change is instantaneous and omnipresent and defined by the Quantum Age. As we initiate, establish and activate the new "International Quantum Exchange for Innovation" or "IQ:EI" we aim to be at the forefront of nurturing Quantum Technology ideas, inventions and innovations.